The pneumatic chipping hammers are used in various industrial applications. 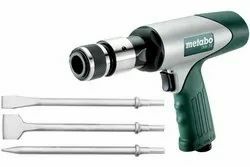 We offer our range of pneumatic chipping hammers in different specifications to meet varied industrial requirements. Air Inlet Size: 3/8'', 1/4"
Piston Stroke: 2-1/2", 4", 2"
Ideal Tool for Quickly and efficiently removal of Weld Spatter, Rust and Other Debris from most surface. Compact, heavy-duty construction for tough industrial applications .